Sunday’s Manitoba Marathon will see several streets blocked off, with traffic being redirected along other routes. The ongoing reconstruction of the Jubilee Overpass had forced crews to completely block northbound and southbound traffic on Pembina Hwy. between Merriam Blvd. and Stafford St. on Sunday during the marathon. 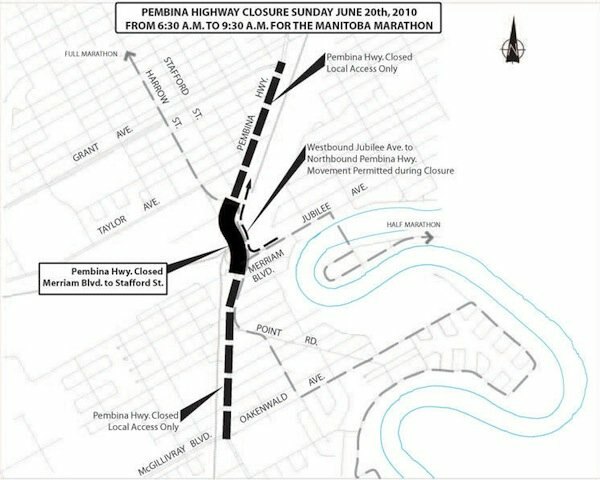 Motorists can use westbound Jubilee Ave. to northbound Pembina during the marathon closure. Pembina Hwy. will also be restricted to local access only between McGillivray Blvd. and Merriam Blvd. and between Stafford St. and Grant Ave. The complete closure and local access closure will be in effect from 6:30 a.m. to 9:30 a.m. Click the map for a larger view. Motorists are advised to avoid the area around the Jubilee overpass during the Manitoba Marathon and use alternate routes. Agassiz — 6:20 a.m. to 1 p.m.
Wildewood/Point Road — 7 a.m. to 8:30 a.m.
River Heights — 7:30 a.m. to 9 a.m.
Assiniboine Park/Bruce Park — 8 a.m. to 9:30 a.m.
Wolseley/Armstrong’s Point/Osborne — 8 a.m. to 10:30 a.m.
Lyndale Drive — 8:30 a.m. to 11:30 a.m.
St. Vital Road/River Road — 7:45 a.m. to 12:30 p.m.
For affected transit routes, consult WinnipegTransit.com. No parking signs will be in effect along the 26.2 mile Manitoba Marathon route from 2 a.m. to 2 p.m. on Sunday.